“Doc, Fuzzy just doesn’t seem right. He’s been sleeping a lot lately and he doesn’t walk as far as he should when we go out. He just sits down and refuses to go further until I turn around and face home, then he miraculously has enough energy to go the direction he wants to go! I can’t imagine what could be wrong with him,” said Antoinette, Fuzzy’s human mom. Antoinette is no dummy. She brings her pets yearly for check-ups, asks smart questions, like, “Do we really need all of these vaccines,” and her dogs are always happy and well-adjusted. Sleeping through a physical exam? Usually abnormal. You would think Fuzzy, the 20 pound-long-haired muttzit mix would have arthritis, or heart disease, or an infection slowing him down. Maybe you would think he has a behavioral problem in which he manipulates his mom into doing what he wants for no humanly-discernable reason. You might think these things until you learn that Fuzzy is only 2 years old! Two?! And he cannot walk more than a block, sleeps all day, and generally looks like a washed-out version of a dog. Doc ran her hands over Fuzzy’s fuzzy forehead. He barely looked up. Then she tickled under his chin and around the side of his jaw (most dogs like that!) This is not mere entertainment, the submandibular lymph nodes live just under the back curve of the jaw where it meets the throat. Normally, you can feel these lymph nodes as robin-egg sized roundish things. Both of Fuzzy’s were severely enlarged. Next Doc Truli checked his ears. After all, the normal job of the lymph nodes is to help drain and clear infections from their assigned regions of the body. “The lymph node nearest and toward the heart from an infection should be a little enlarged as it activates to handle the extra work of cleaning up the infection,” says Doc Truli. Fuzzy’s ears were perfect. His teeth were beautiful. His skin was clear. Doc went on high alert. armpits), the inguinal (in the groin), the popliteal (back of the knees) and an abdominal feel revealed lumps in the abdomen. A rectal exam revealed enlarged sub-aortic lymph nodes (under the spine, above the colon). 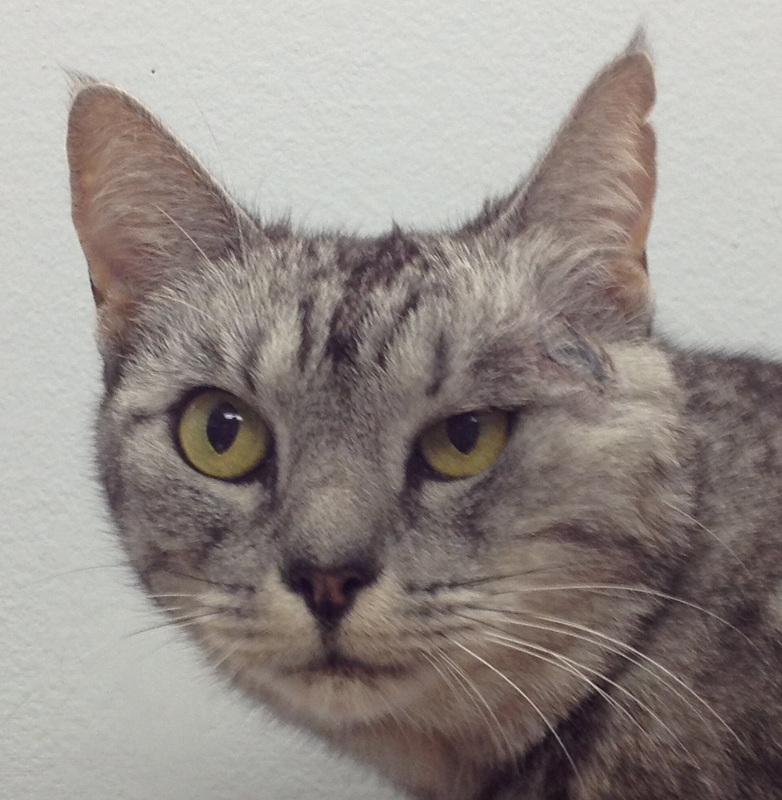 Fuzzy had generalized lymphatomegaly. Infection, typically by viruses or bacteria, and cancer, cause enlarged, swollen lymph nodes. If one or a few lymph nodes are large, then usually, we think of a bacterial infection activating them to do their job. This is overwhelmingly likely in any given pet. When all or many of the peripheral lymph nodes are swollen, we get concerned about an infection that is traveling in the body, like ehrlichia canis and many others. Your veterinarian will know what is common in your geographical area and advise you what tests may be needed. When all the lymph nodes are suddenly enlarged in a young dog like Fuzzy, you would think he would be safe from cancer. Unfortunately, lymphoma is a cancer of the lymph tissue (the stuff that makes up lymph nodes), and can arise in any age pet. 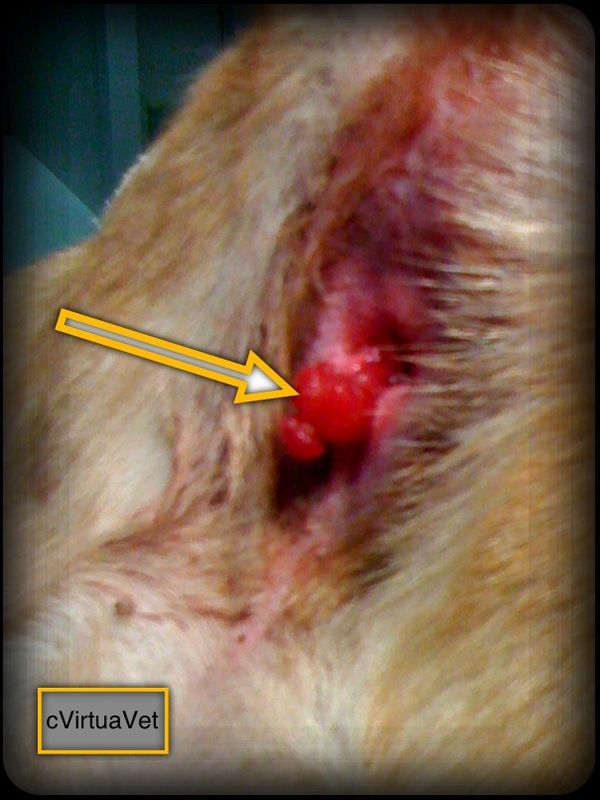 In Fuzzy’s case, we opted for a biopsy of a lymph node in order to confirm the diagnosis and to type the lymphoma, as different types respond to different medications. Why Is Biopsy (Usually) Better Than Needle Aspirate Cytology? Many lumps on the body can be diagnosed with a needle aspirate. For lymph nodes, this is frustrating, and usually a waste of time and money. Why? Because a “busy” lymph node fighting infection looks the same as a cancerous lymph node growing large for no good reason at all. They are almost indistinguishable on needle aspirate cytology. A biopsy is superior because the cells and their “business” of what they are doing can be preserved in relation to one another. Think of it this way- if you see a teen-ager wearing black, smoking, and hanging outside a club, you do not know if you have an artsy future Harvard graduate going through a “phase,” or a juvenile delinquent headed for prison-unless you see that individual at work with friends in her typical environment. Then you have a better picture of what is going on – not perfect, but better. This is the difference between a cytology which looks at each cell out of context and a biopsy look at tissues in their biological strata. Please note Sharon’s comment at the end of the story. She rightfully points out the fact that ultrasound guided fine needle aspirate of an internal organ can be an excellent method for diagnosing lymphoma. Doc Truli explains more about peripheral lymph node fine needle aspirates versus internal organ aspirates. A prescapular Lymph node serves as a biopsy site. Fuzzy’s biopsy confirmed lymphoma. We selected a cancer treatment protocol and holistic protocol for whole-body support which he tolerated very well, with very few side effects. His energy picked up and he enjoyed himself immensely during baby squirrel season. 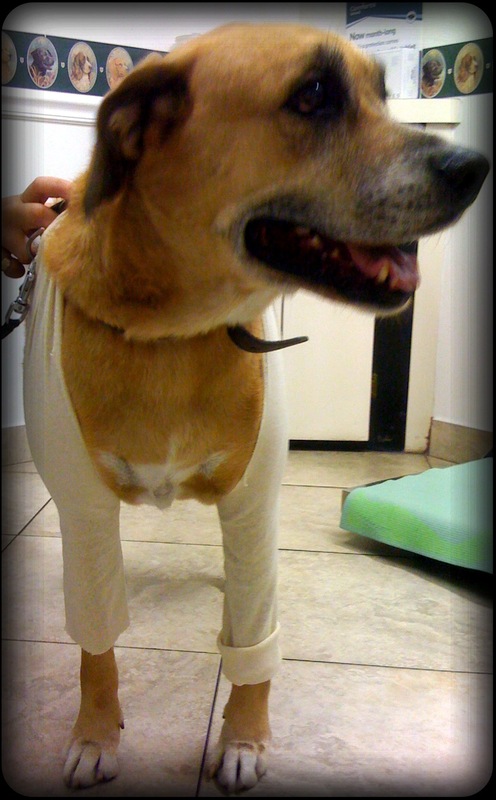 Fuzzy remained happy and disease-free for about 6 months, then he started to grow new tumors and feel sluggish again. After a year, it was the end of the journey for this awesome dog. Rest in peace, Fuzzy. Editor’s Note: Many dogs go into remission or live for years with lymphoma treatment. Fuzzy’s results were a little disappointing. 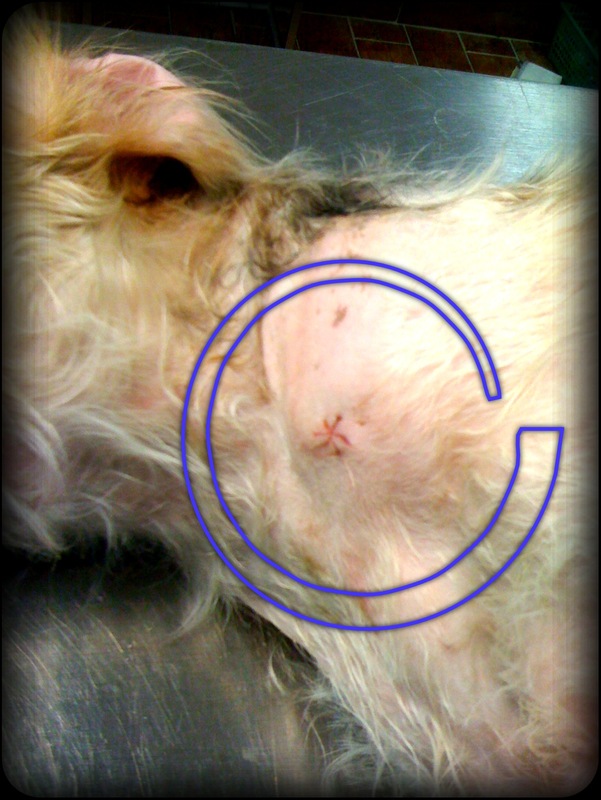 ← What’s This Hole in My Dog’s Elbow? I noticed my 5yr old dog’s submandibular glands were swollen on August 17th. I took him to our self-proclaimed “good ol country” vet on the 19th. 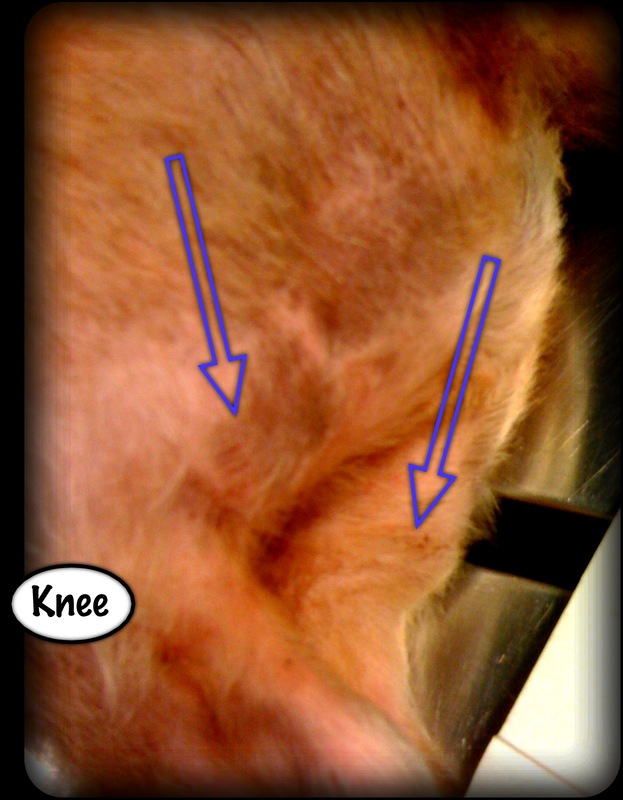 The vet looked at Mac’s glands and noticed his popliteal glands were also swollen a little. He was given 10 days worth of antibiotics and prednisone. I took him back to the vet on the 26th and his submandibular glands were a little more swollen. Along with the swelling in his popliteal glands, he also had swelling in his inguinal glands, especially the one on his left side. Our vet then said he was 99% positive it was lymphosarcoma. That we could do the blood tests and small needle aspiration, but it would be a waste of time and money. Not to mention unnecessary stress on my very timid dog. The best we could do is keep him comfortable with Prednisone until it was “time” and that the swelling of his submandibular lymph nodes would probably eventually swell to the point where he wouldn’t be able to breathe or swallow. I know I do not want to put him through chemotherapy treatments. My question is what else can I do to keep his submandibular lymph nodes from swelling? They are very swollen now, but he’s not having any trouble breathing or swallowing yet. In fact, he’s very much back to his active, silly self like he’s not sick at all. I do give him 4mg of Ondansetron (Zofran) a day for nausea, with an option of another one per day. He’s back to eating even. Actually he has been eating A LOT more than he ever has! Please give me ANY advice you can!! It’s greatly appreciated!! Thank you very much!! I am so sorry to hear that your dog has lymphoma. I cannot give any medical advice without a valid patient-doctor-client relationship. In other words, without a physical exam! I can tell you that keeping those glands down once they do not respond well to prednisone anymore is beyond me. Perhaps beyond regular medicine. 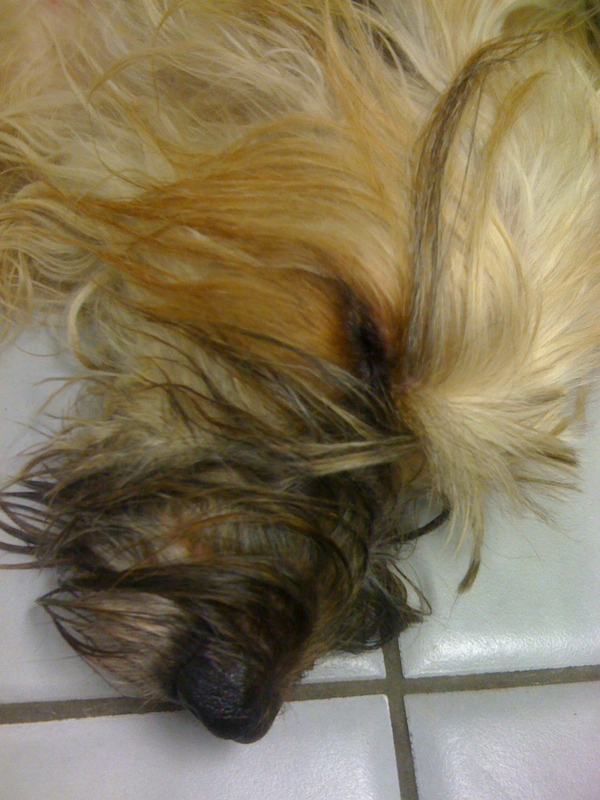 Lymphoma is one of the most treatable dog cancers. Your veterinarian, or a specialist they may refer you to, are your absolutely best sources of advice for your dog. As far as I know, multi-drug chemo is best to keep those glans down and single drug chemo with pred is inexpensive and works well for a while (weeks to months, usually.) If you choose the pred only route, you lose the option of chemo later. It flat-out will not work according to current published research. Hello , i have a 5+ year old male cocker spaniel . For the last 3 weeks or so we have been noticing swollen glands like things in both sides of his jaw , the area where we usually tickle or run our fingers . According to this article i think they are the submandibular lymph nodes . My dog isn’t eating anything for the last two days . He’s refusing all his favourite foods like chicken , biscuits etc. He’s only drinking water after every few hours & sleeps most of the time . He also vomited 2 times within these two days . I tried to give him some biscuits which he ate yesterday . But today he refused to eat them . We are really worried and have decided to take him to a nearby vet . But can anyone enlighten me on limphoma and lipoma . And what’s the difference between them . 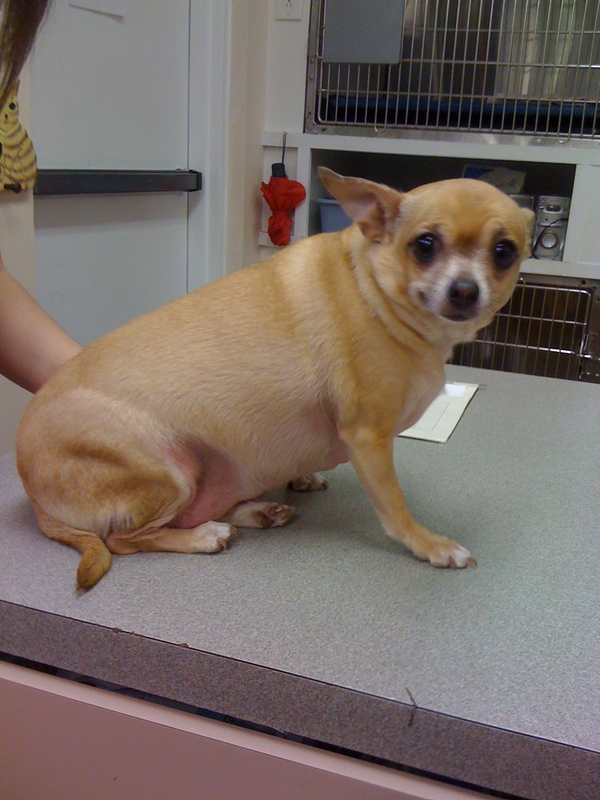 How will i know whether my dog’s swollen submandibular lymph nodes are limphoma or lipoma or some other “oma” like diseases . Another thing i would like to mention here , is that my dog has a big wart / mole on his cheek for the past 3 years or so . At first it was small , but now quite big and is visible since it sticks out from his cheek fur . We thought of removing it surgically but then read of an incident where the doctor recommended the surgery and later the dog died . These are great questions for your veterinarian. Or Merck Veterinary Manual, which is available online. Spelled: lymphoma, lipoma. mu Joysie was diagnosed with a needle aspirate. her vet said she saw enough eosinophils to make her suspicious, especially after checking Joy over, asking about how she was feeling, eating, playing etc. she sent a slide of the aspirate to the Vet college in Colo. who confirmed Dr. Brenda’s diagnosis of lymphoma. now i wonder if we should have done a biopsy; the node was growing fairly quickly but perhaps it was just an infection and i put her through 4 months of misery with chemo before her death. that’s a horrible thought…. OMG! I did not offer my opinion in order to make you second guess yourself and your vet. I’m positive your vet did the right thing. You know what your Joysie needed and you helped her as best you knew how. BTW- with expert advice. Please do not second guess yourself. No one orders chemo lightly. I mentioned biopsies of peripheral lymph nodes because many people ask me if there is a cheaper way than biopsy, and the oncologists I work with prefer a peripheral lymph node biopsy over a needle aspirate in order to be sure before they start chemo. An ultrasound-guided needle aspirate into an internal organ is even more proof of actual lymphoma. It all depends on the expertise of your veterinary team and the pathology specialist. There are regional differences and opinions and lymphoma is not always easy to diagnose. Remember…we do what we think is best for our pets at the time…there is no wrong answer! We love articles that discuss Dog Health and How to perform a Home Examination of your Pooch. Here’s another great one. Remember, pay attention to your Pooch, he will let you know when something is wrong. Thank you so much for this post on lymphoma in dogs — a subject dear to my (heavy) heart. The photos of the swollen nodes are so helpful. I had no idea what or where they were before Gadget got lymphoma. I will share this with my canine lymphoma list. For anyone reading this who is facing canine lymphoma, there are several options for treatment, ranging in likelihood of length of remission and cost. Some are very expensive, some are quite inexpensive. Chemo is expensive but gives the best chance for a long remission. The average remission time on the best protocol (Madison Wisconsin) is 8-12 months (depending on your source), but keep in mind that that means that half of dogs are under that and half are over. Usually second and third remissions are half as long as the initial one (if they are gained at all). *Most* dogs respond well to chemo, and it makes them feel better, not worse (unlike people) because vets use a dose to try to suppress the cancer but not to try to cure (which would require higher doses that would cause a lot of side effects). The cure rate with chemo is low, but exists. Different sources put it at 0% to 10%. I think most put it at 1-5%. It’s very unlikely, but there are occasional miracle dogs. Dogs diagnosed when asymptomatic (when they are still behaving as if they feel pretty good) and/or at stage III or IV are more likely to respond well to chemo and to have longer remissions than dogs who are diagnosed when they are already feeling/acting sick or at earlier or later stages. B-cell usually responds better than T-cell to treatment. To be more specific about fine needle aspirate and lymphoma- if you have an ultrasound and see abnormalities in the organs, or then you find lymph cells in organs like the liver or spleen, we know they are not supposed to be there in any significant numbers. In this case, when you see the lymph cells, you know they are cancerous because they are out of context, and the special testing to differentiate the B and T-cell lines are accurate on these samples. In a peripheral lymph node on the outside of the body, if you perform a needle aspirate, then individual lymph cells are spread on a microscope slide. If the lymph cells are activated by infection, they will be rapidly dividing in order to make more cells to fight infection. They will have prominent nuclear content, unravelled nuclear DNA – because it is active and being copied – and many of the cells will be caught in mitosis. In other words, you can see one cell double its DNA and pull apart into two DNA-identical cells, or clones. A characteristic of cancer is rapidly dividing cells. Under the microscope, many of the cells will be caught (like a snapshot) in the process of mitosis. From a peripheral lymph node, even a specialist would be challenged to tell the difference between a lymph cell dividing in an appropriate response to an infection and a cancerous lymph cell dividing and multiplying out-of-context due to cancerous changes in the cell. A fine needle aspirate of an internal organ is a perfectly valid way to diagnose and type lymphoma. Please visit Sharon’s blog at http://www.AfterGadget.wordpress.com . Sharon is a fabulous professional writer who takes the time to give us great writing, with useful references, and a personal, heartfelt point of view. She is Doc Truli’s favorite blog writer. That was such a clear and helpful explanation of what a vet sees under the slide, and how you differentiate cancer from infection. I so much enjoy learning the science behind the decisions we make on behalf of our animals. I was also very pleased and touched by what you said about me and my blog. Thank you so much! You are very welcome Sharon. I love the work you do.